Multimedia machine. The spec sheet of the L50 is quite impressive. Toshiba's Satellite seems to absolutely satisfy private users with a strong CPU, a 1 TB hard drive, a graphics card from AMD, and a DVD burner. All that is available for a reasonable street price of 1000 Euros (~$1263). Where is the catch? Multimedia laptops are usually all-rounders that are not inevitably focused on computing power - a sufficiently sized screen of 15-inches or more, a generous hard drive, and ideally a DVD drive are enough to make the desktop computer superfluous for private users. At first glance, Toshiba's Satellite appears to be an unseemly laptop without any special bells and whistles that lets it stand out from the mass of 15-inch laptops, and which allows browsing on the couch after work, excessively consuming YouTube videos or watching a DVD. Nevertheless, the computing performance supplied by Intel's Core i7-4500U, AMD's Radeon R7 M260 graphics card and 8 GB of RAM sounds decent, and it gives hope that applications will always run smoothly. The hard drive's capacity of 1 TB is also absolutely suitable for using the laptop as a data tomb for music or video collections. Since digital video discs are not yet extinct, the DVD burner still makes a lot of sense. There are quite a few contenders in this sector. The not as tech-savvy private user can easily lose the overview among the details in the multimedia category. We will attempt to make a direct comparison between devices with an identical configuration and price point anyway. For example, Acer's Aspire E5-571G-536E only has a weaker i5 CPU, but it has a stronger and thus gaming suitable Nvidia GeForce 840M graphics card. 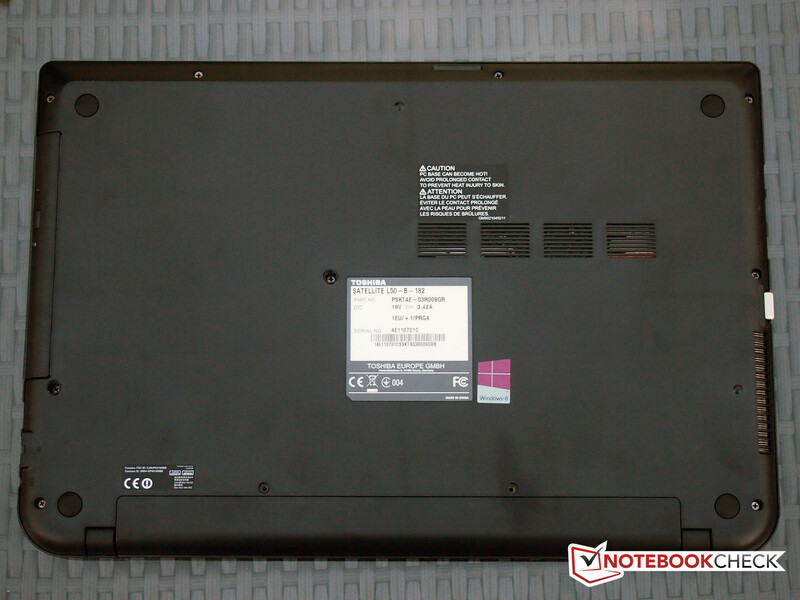 We also compared Toshiba's Satellite with the IdeaPad Z50-70 from Lenovo. Its price is identical, but it has a stronger CPU/GPU combination. 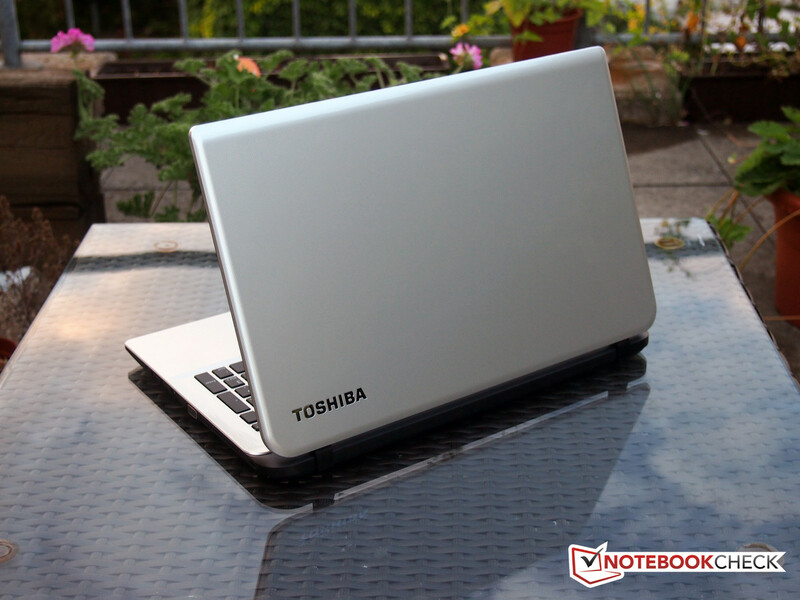 Unlike other manufacturers who try to imitate brushed aluminum on plastic casings, Toshiba's Satellite L50-B-182 does not make the glossy finished plastic a secret. The lid's back and the area around the keyboard feature a restrained, stylish pattern that somewhat relativizes the cheap glossy looks. Only the underside and the rim on the display's hinges are matte. Although everything is shiny, the casing is not susceptible to fingerprints so that the wrist rest is not perpetually smudged like on some other devices. Although the Satellite's stiffness cannot compete with high-priced aluminum casings, it does not have any major flaws. The hinges allow opening the display to approximately 135 degrees and always keep it firmly in position even on shaky surfaces. It can be opened easily with one hand. Some areas on the surfaces dent a bit under pressure, but that at most makes a slightly cheap impression on the keyboard. Although the connectivity includes everything that a multimedia laptop needs, it is not exactly lush - it is at best middling. Only three USB ports are installed in form of one USB 2.0 on the left and two USB 3.0 ports on the right. The HDMI and VGA out at least enable using two external monitors simultaneously. Only one jack is available for a microphone or headphone. Users who want to use both at the same time will either need a combo plug, a Y adapter or use Bluetooth from the outset. Additionally, a full-sized Gigabit LAN socket is installed, as well as the compulsory slot for a Kensington lock. Solely the SD-card reader is on the front. In addition to the mentioned Gigabit LAN, Intel's Wireless-AC 7260 module supports wireless communication with current Wi-Fi standards and Bluetooth 4.0 LE. We did not observe any weaknesses in the Wi-Fi range in the tester's personal settings. The connection was still unbroken even over one story away. The webcam incorporated into the display bezel has a resolution of 1280x720 pixels, which is rather common. It is nevertheless sufficient for occasional videoconferencing via Skype. Apart from the compulsory power supply, Toshiba does not include any additional accessories for the Satellite L50-B-182 in the standard configuration. The manufacturer does not offer any model-specific accessories either. Users who want to access the innards will first have to remove several screws before lifting off the entire base plate. A bit of caution is needed to release the cover's fixtures. Though an expert will not be needed, there are more user-friendly systems, for example, those that have an extra and easy to remove cover for frequently used components, such as the working memory or hard drive. It is not possible to remove the battery without tools because it is fastened to the casing with two screws. Removing the battery manually via a spring mechanism in a laptop of this size was still customary a few years ago. Nowadays, users apparently have to accept non-removable batteries - not only in the Satellite. Toshiba's Satellite L50-B-182 is shipped with a two-year manufacturer warranty including pick-up service in Germany and Austria. According to Toshiba's website, the claim has to be registered via the laptop hotline in advance. Beyond that, the manufacturer also offers various warranty extensions to three or four years. However, they cannot be purchased via Toshiba's website where only a retailer search box is provided. 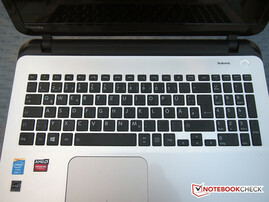 The keyboard in the multimedia laptop is a chiclet style model. 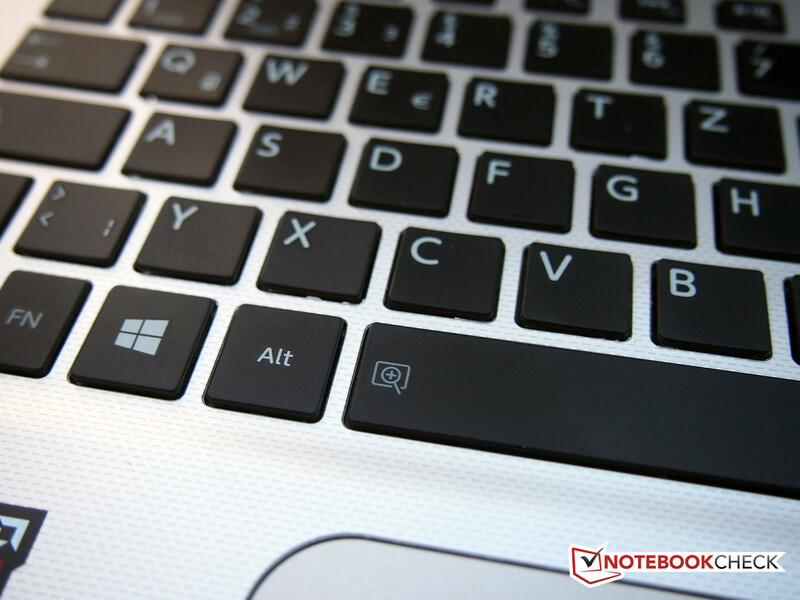 The level, angular keys with a gap of a few millimeters have become popular in most laptops and are likely the most commonly found keyboard units. They allow fast typing, and that is also well possible in this case. The keys feature a clear, crisp and short drop, so there are no quality deficiencies. 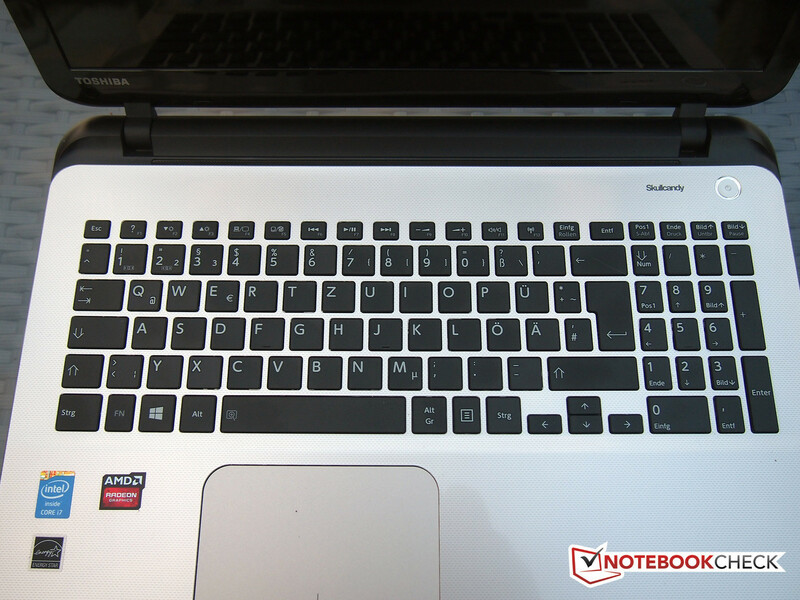 The surrounding keys yield slightly while typing, which makes the keyboard seem a bit cheap. However, that will at most affect the aesthetic sense, but not impair the functionality. A bit unusual: The F keys have to be triggered via the function key, for example FN + F1. They are mapped with basic laptop functions, such as screen brightness, volume or Wi-Fi on/off, when pressed alone. 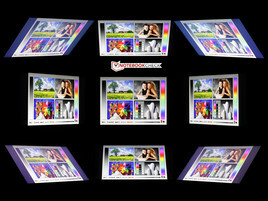 The reversed key mapping is quite useful for private users and is thus also becoming more common in multimedia laptops. As described above, the wrist rest is made of glossy plastic, but the touchpad is matte. 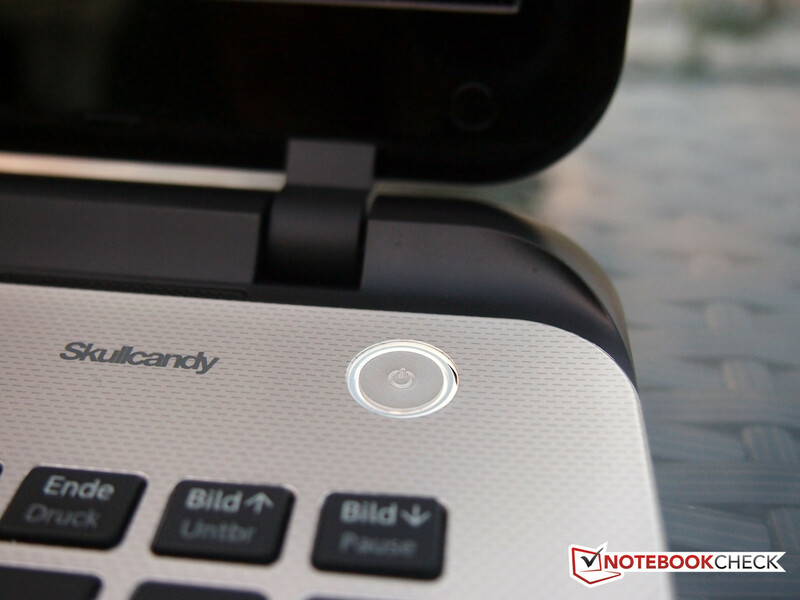 Consequently, it provides a pleasant feel, allows the finger to glide smoothly and control the cursor accurately. Standard multi-touch gestures, such as two-finger scrolling or pinch-to-zoom, are implemented immediately and without problems. Besides that, mouse buttons are hidden under both lower corners of the touchpad. The touchpad is disabled automatically when an external USB mouse is connected by default. 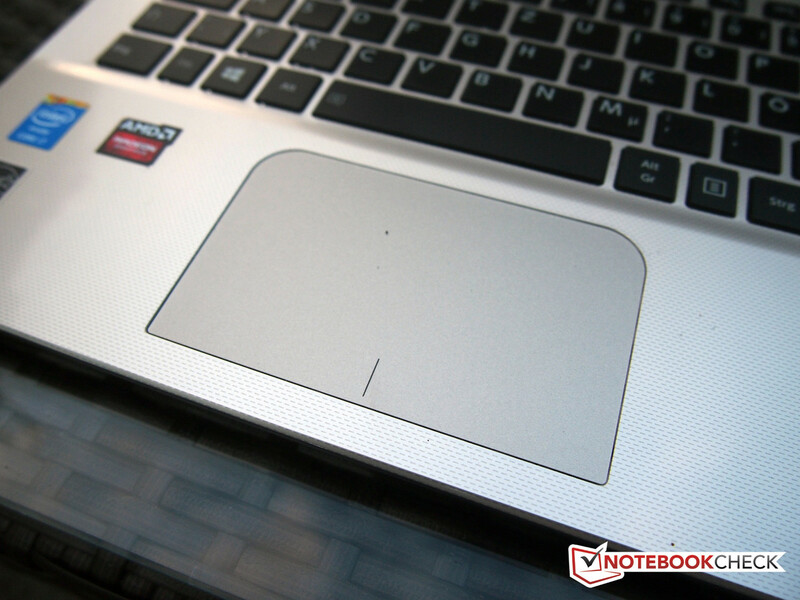 However, the touchpad can be turned on and off as required via a function key. The image is displayed on a glare-type IPS screen with a size of 15.6-inches (39.6 cm) and a Full HD resolution of 1920x1080 pixels. The brightness rates of the screen are above average. 378 cd/m² is an outstanding rate that implies outdoor suitability. 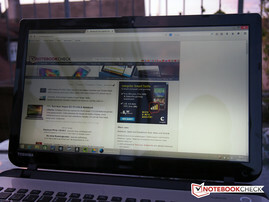 A direct comparison with the contenders also shows that Toshiba's Satellite also clearly outshines the other devices. The screen's other rates are also excellent. The contrast ratio of 1042:1 and the resulting rich black level of low 0.31 cd/m² speak for a very good image quality and are surprising for a laptop from the mid-price range. 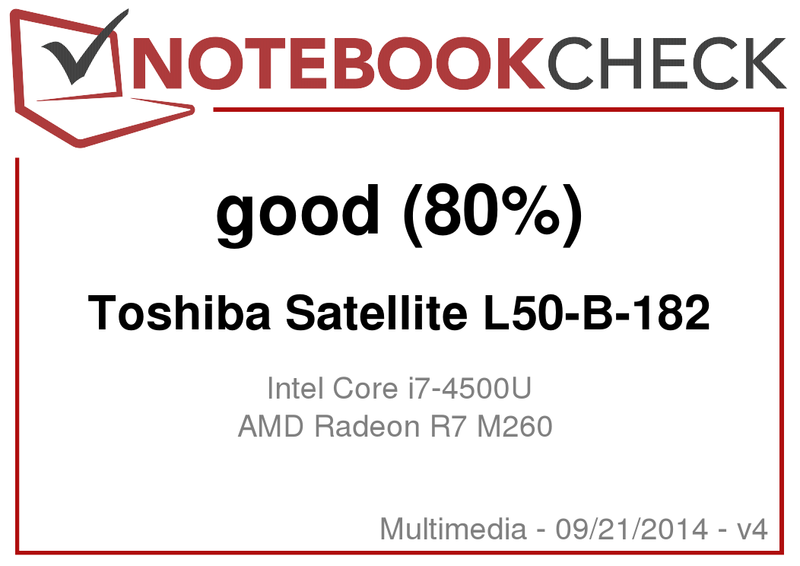 Toshiba's L50-B-182 also has a clear lead in the comparison here. While the color accuracy analysis with CalMAN makes a bluish cast in many screens in mainstream laptops, we did not ascertain this here. 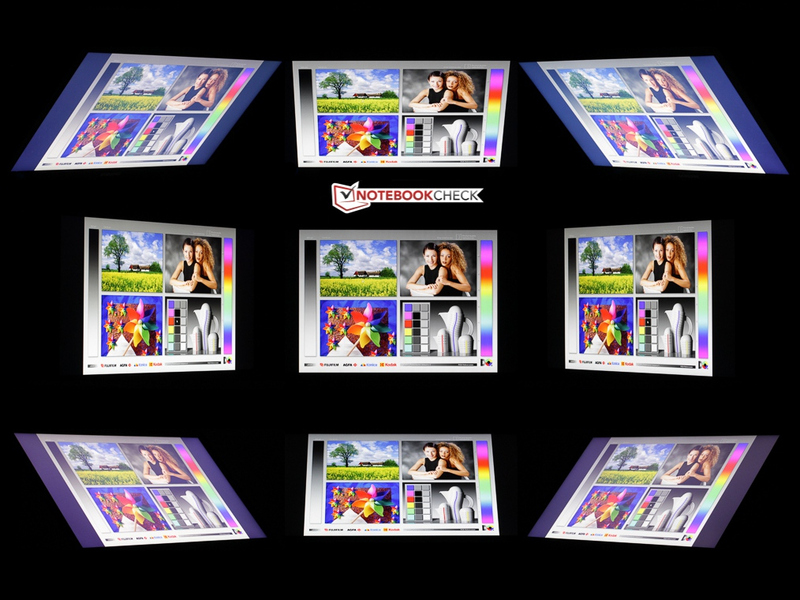 The average DeltaE 2000 shift of 4 speaks for a good color reproduction. We are quite used to higher shifts in this price range. Although the distracting reflections ruined the outdoor suitability a bit in the practical outdoor test, it is quite possible to use the laptop in the open air owing to the outstanding maximum brightness. The user can even work outdoors on bright, sunny days as long as the sun does not shine directly onto the screen. An IPS screen always provides good viewing-angle stability - and the Satellite L50-B-182 is no exception. Only the brightness suffers when viewing the screen from slanted angles. 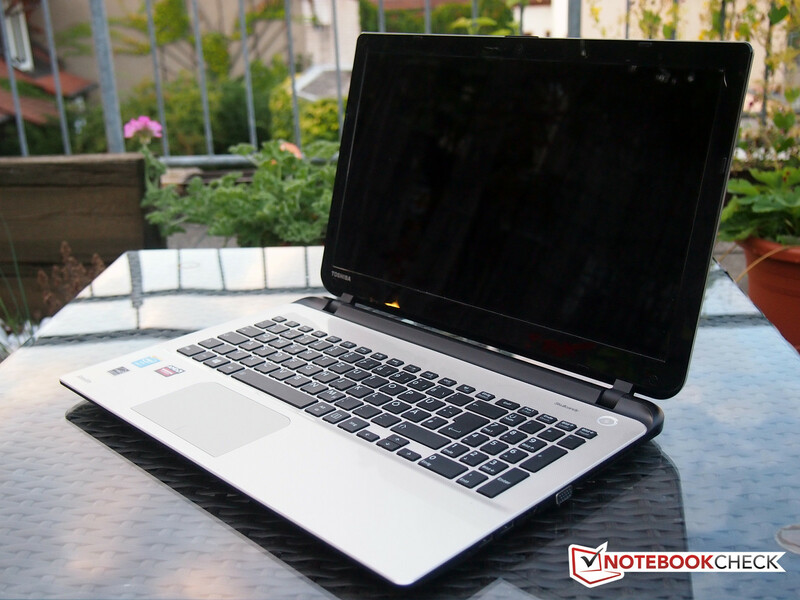 Thus, the multimedia laptop is very suitable for spontaneous video nights with several people who do not imperatively look at the screen in a right angle. 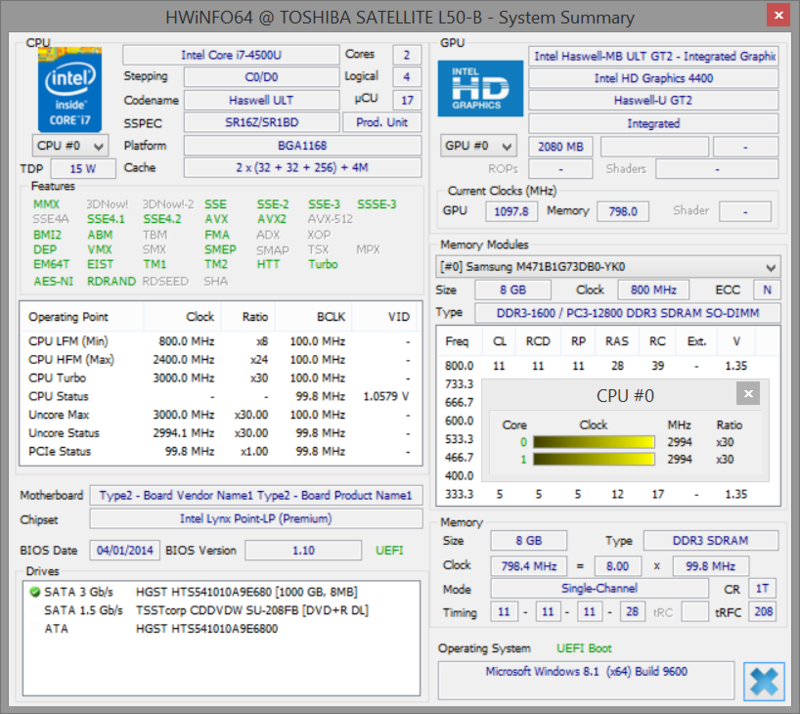 Intel's Core i7-4500U processor is installed in Toshiba's Satellite L50-B-182. Intel's HD Graphics 4400 is integrated into the CPU. 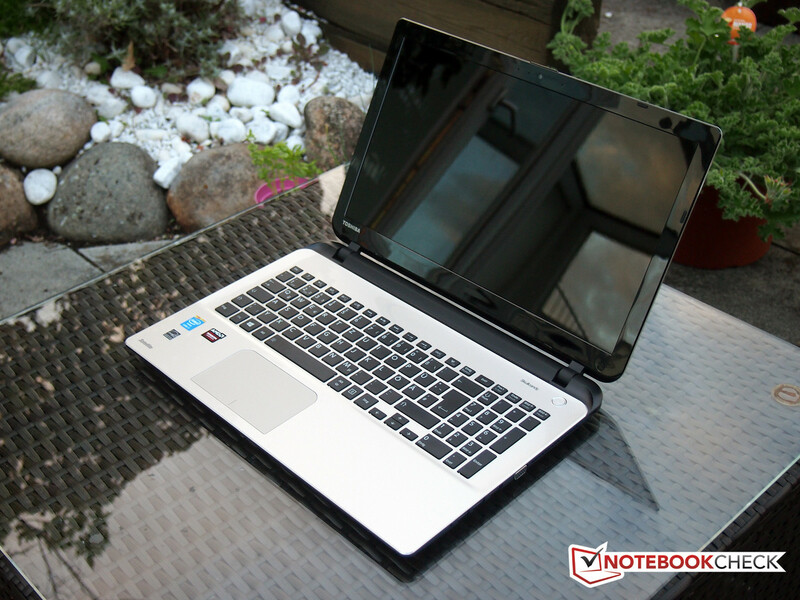 The laptop additionally sports AMD's Radeon R7 M260 dedicated graphics card. This graphics chip is, however, from the lower mid-range, and it only conditionally allows smooth gameplay. However, the 8 GB of working memory is very satisfying, just like the relatively large hard drive with a capacity of 1 TB. The laptop should be more than aptly equipped for solely routine office applications. Thus, demanding image processing, occasional video editing or slightly older games will unlikely be a problem for the multimedia device. 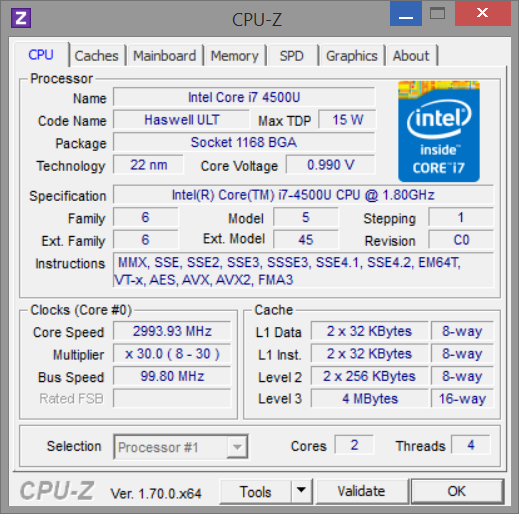 Intel's Core i7-4500U is an energy-efficient ULV processor that is frequently installed in ultrabooks due to its maximum power loss (TDP) of 15 watts. Of course, a standard-voltage processor offers a wider performance range that many private users would not necessarily need. They would more likely want the benefits of a longer battery runtime that results from the lower power consumption. Despite ultra-low voltage, it is a strong dual-core processor from the current Haswell generation. The two cores support Hyper-Threading and can therefore process a total of four threads. 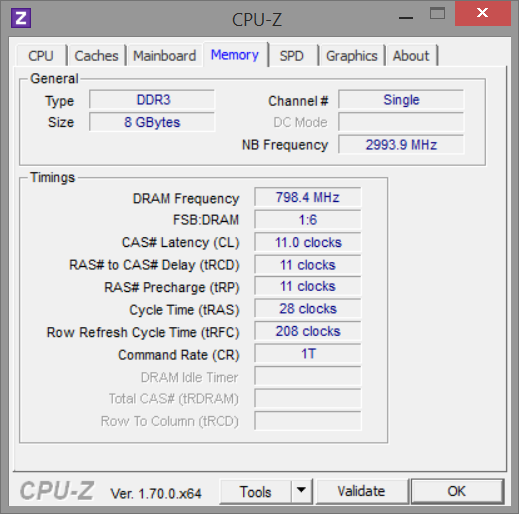 The CPU's clock rate ranges between 800 MHz and up to 3.0 GHz via Turbo Boost depending on the performance requirement. Performing a Cinebench benchmark in battery mode did not result in any significantly different score. Consequently, the CPU's full power is also available without an external power source. We routinely use Futuremark's PCMark to ascertain the total performance. A comparison based on the scores reaped in by equally-priced contenders shows that the model with the higher-performance GeForce graphics card offer a clear plus. 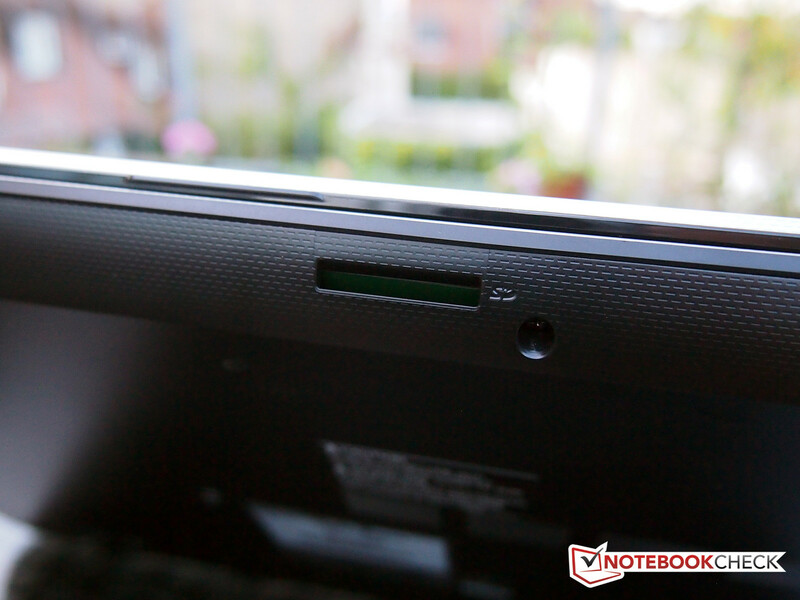 Lenovo's Z50-70 is at the very front because it benefits from its SSHD. A standard-sized 2.5-inch storage device with a capacity of 1 TB is installed. It is dubbed HGST HTS541075A9E680. The hard drive spins with 5400 revolutions per minute and thus does not break any records in read or write speeds. However, users who are looking for this should prefer an SSD from the outset. 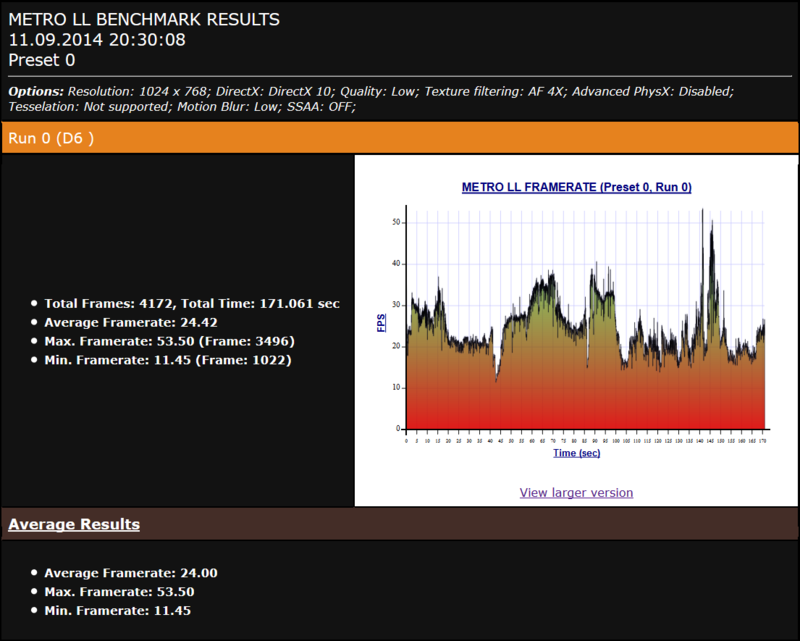 The benchmark using the HD Tune tool delivered a slightly below average transfer rate of 66 MB/s. A strong fluctuation can be inferred here when considering the minimum of only 2 MB/s. This did not look different even after several runs. Nevertheless, it cannot be said that the drive is too slow or leads to perceivable performance losses. There is no question that flash drives provide a higher performance, and the difference was explained under System Performance. 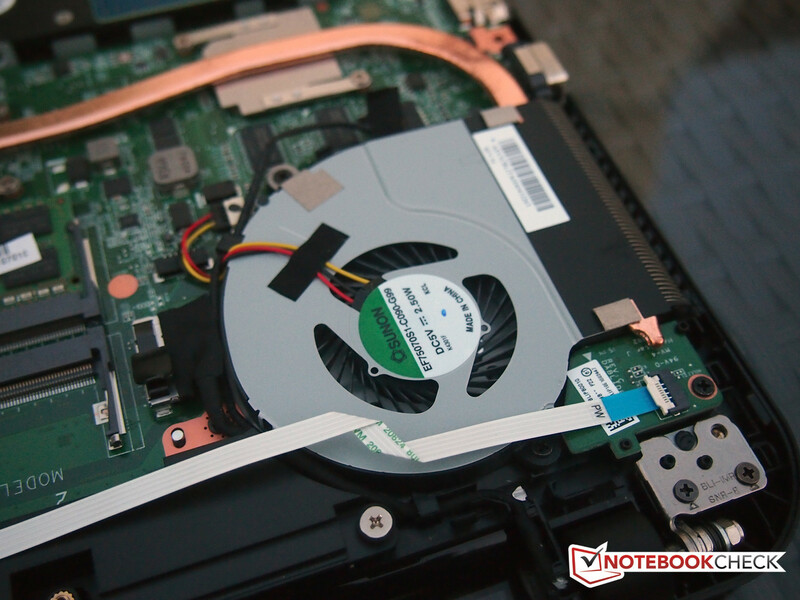 Toshiba's Satellite L50-B-182 sports the dedicated AMD Radeon R7 M260 graphics card. Its performance is roughly located in the lower midfield of current laptop graphic chips. 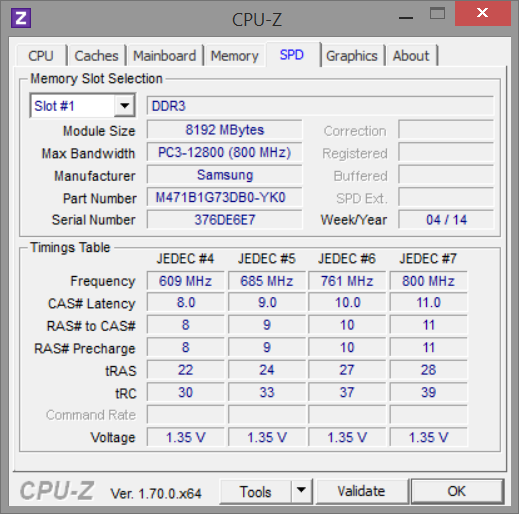 Though it is a bit superior to CPU-integrated solutions, it is only conditionally suitable for gaming, as can be seen in the following benchmarks. Nevertheless, Radeon's graphics unit has a dedicated memory of 2 GB and supports DirectX 11.2. 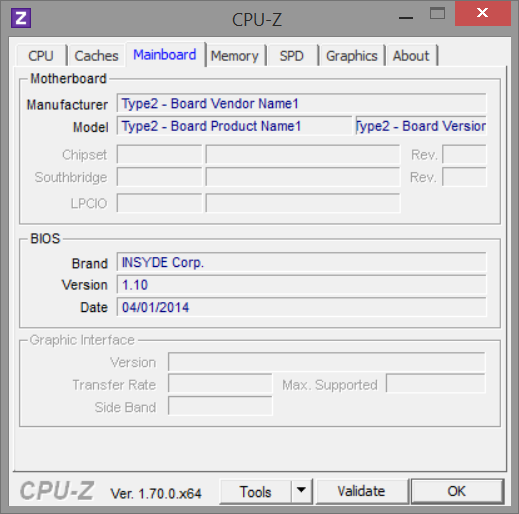 Intel's Core i7-4500U also provides the integrated graphic unit Intel HD Graphics 4400. Depending on the load, the system switches between both graphics chip for energy efficiency reasons. 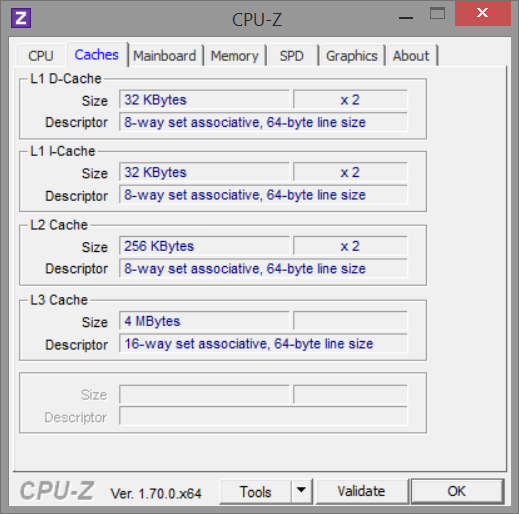 This function has become standard for both AMD and Nvidia modules in laptops. 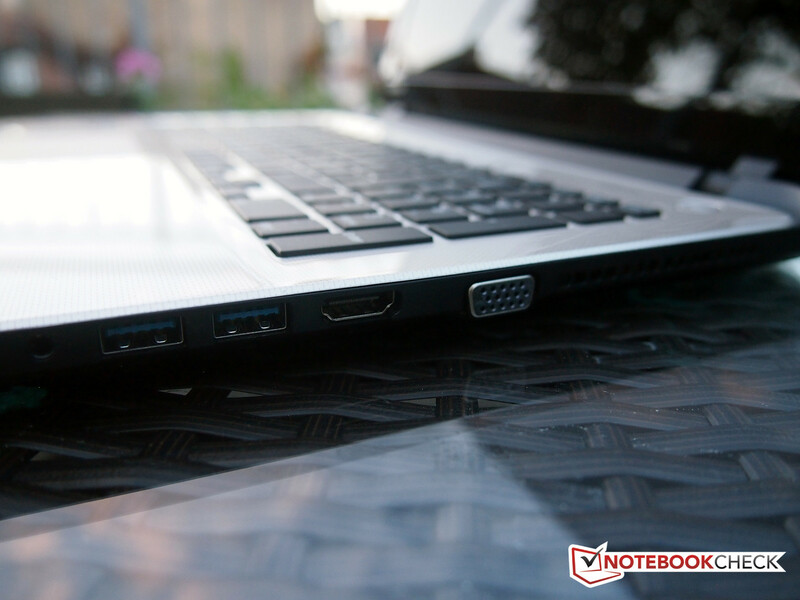 Contending devices, such as Lenovo's IdeaPad Z50-70 or HP's Pavilion 15-p008ng, feature a higher-performance GeForce graphics. That is evident in the benchmarks performed with 3DMark below: The GeForce 840M, for example, achieves a 40% higher score in contrast to our Radeon graphics unit. The 3DMark benchmarks already indicate that the Radeon graphics does not provide the highest gaming quality. As expected, that is reflected in the gaming benchmarks. The Satellite will struggle with brand new, graphic-intensive games. However, some major compromises will also have to be made in resolution and graphics details in games from a few years ago. That can be seen in the random tests we performed using the role-play classic Skyrim and the performance-devouring story shooter Metro: Last Light from last year. Neither game is fun in the native Full HD resolution. The user will have to massively turn down these settings and reduce the graphics details to at most medium to achieve a smooth gameplay. Other gaming benchmarks that we performed with AMD's Radeon R7 M260 presented the same results. Fortunately, the fan is virtually always inactive when basic office tasks are performed or the user only browses on the Internet. It only starts up occasionally, runs at a low speed, and it is barely audible - let alone distracting. Quiet noises are occasionally produced when the hard drive is accessed, but they are hardly worth mentioning. The same is true for the DVD drive. The fan is only audible in load, but it is not in any way unpleasant. The Satellite L50-B-182 stayed relatively cool during practical use. This is likely owing to the ULV processor's fairly low power loss. The base unit reached a quite high temperature of up to 50 °C only in the stress test. That was, however, only measured in the upper parts; the wrist rest remained pleasantly cool even during full load. Our stress test is not a scenario that will likely occur in real-life anyway. The laptop is put under full load via the FurMark and Prime95 tools to ascertain the maximum temperatures and their impact on the maximum performance. There was no sign of throttling. 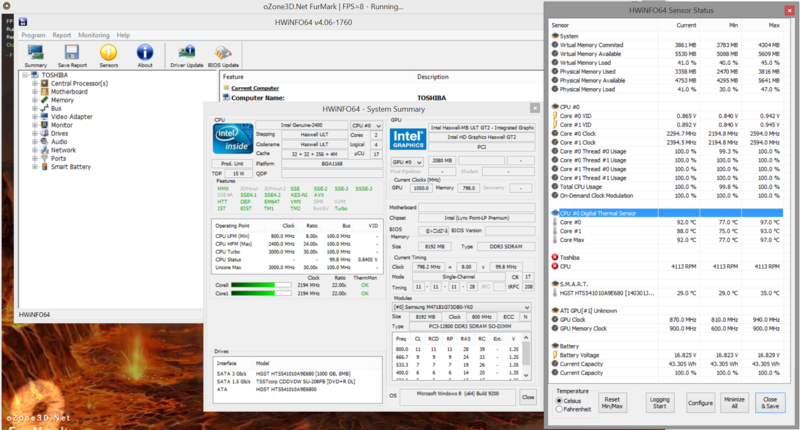 The CPU stably clocked with its base speed of 2.4 GHz. According to the internal sensors, the CPU reached over 90 °C, which would only be critical when it remains at that level even without full load. (-) The maximum temperature on the upper side is 46.6 °C / 116 F, compared to the average of 36.5 °C / 98 F, ranging from 21.1 to 71 °C for the class Multimedia. (±) The average temperature of the palmrest area of similar devices was 29.1 °C / 84.4 F (-0.5 °C / -0.9 F). The stereo speakers from Onkyo are underneath a narrow, almost invisible bar above the keyboard. Although they are not supported by a subwoofer, the sound quality is quite feasible for occasionally watching videos, and they meet the claim of a multimedia laptop. An audio jack is installed for connecting active speakers for higher demands, such as extensive music enjoyment. The laptop's minimum consumption is a modest 4 watts. That roughly corresponds to contending devices with the same CPU. However, the Satellite consumes as much as 55 watts during load. Since the power supply has an output of almost 10 watts more, it is absolutely sufficient for that. All consumption rates are completely within an unspectacular average in comparison with similar laptops. Therefore, there is no reason for either complaint or praise. Surprisingly, the laptop only achieves a short runtime despite its frugal ULV processor. The reason is found in the relatively low battery capacity of 45 Wh for a 15-inch device. We ascertained a maximum runtime of 7 hours and 36 minutes using Battery Eater's Reader's test. The screen was set to minimum brightness and all communication modules were off for this. The Satellite did not last for even half the time in the practical Wi-Fi browsing scenario: only 3 hours and 27 minutes was achieved using a script that opens different websites in regular intervals, medium screen brightness and enabled Wi-Fi. 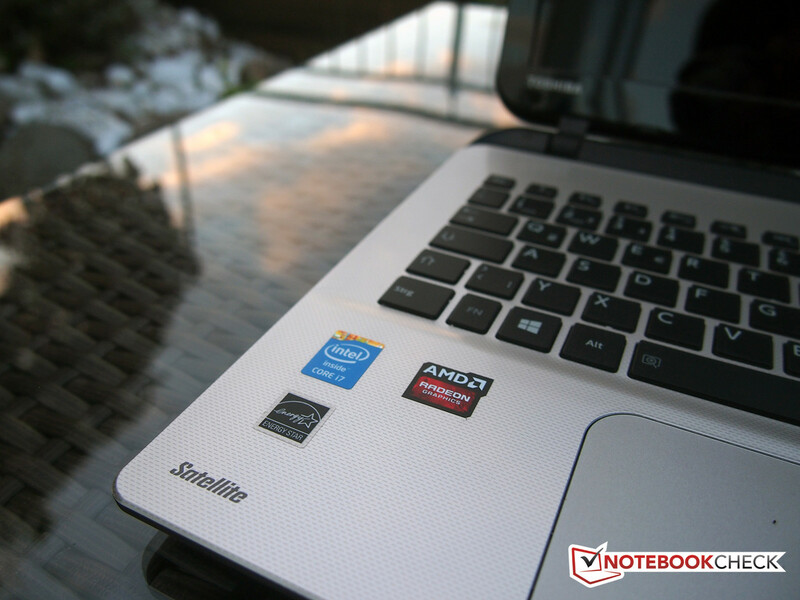 The contenders based on the same CPU, such as Asus' X750LN or Lenovo's IdeaPad Z50, last considerably longer. The minimum runtime of less than 2 hours under load again corresponds to similar devices. Throughout middling: Toshiba's Satellite looks rather ordinary, solid - it might even be called almost boring - in all details at first. 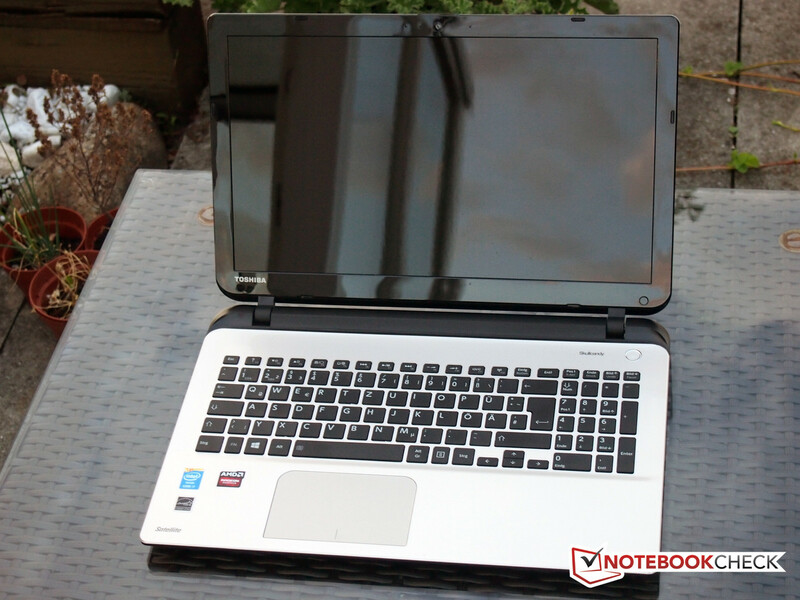 The looks and the spec sheet suggest that it is an unseemly laptop from the multimedia category for private users. This impression is confirmed at a second glance. The laptop has everything that is needed for home use: enough computing power, large screen with an acceptable resolution, DVD drive, and lastly feasible sound. Thus, the device is aptly equipped for the old DVD movies, YouTube and the now increasingly becoming important streaming services. A few details were, however, noticed during the lab assessments though - both positive and negative. The latter was the case with the graphics card. It is simply too weak to supply an adequate gaming performance, which can be expected from a graphics unit in a multimedia laptop. The contenders from Asus, Lenovo and Acer prove that a somewhat stronger graphics card, which does not demand as many performance compromises and considerably expands the application range, is possible without gigantic price jumps. The screen's outstanding brightness and contrast rates surprised us positively. We would actually expect such rates in higher-quality devices beyond 1000 Euros (~$1263). It is aggravating that the screen's reflective surface slightly debases these great properties. However, those are just details that do not ruin the device's round and balanced total impression. 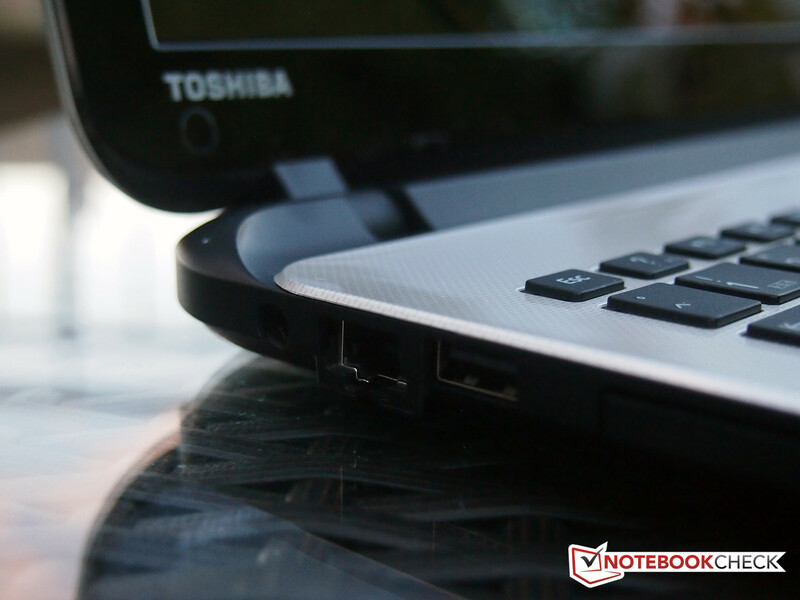 Toshiba's Satellite L50-B-182 is a solid multimedia laptop with a good value-for-money ratio for private users who do not have special requirements. 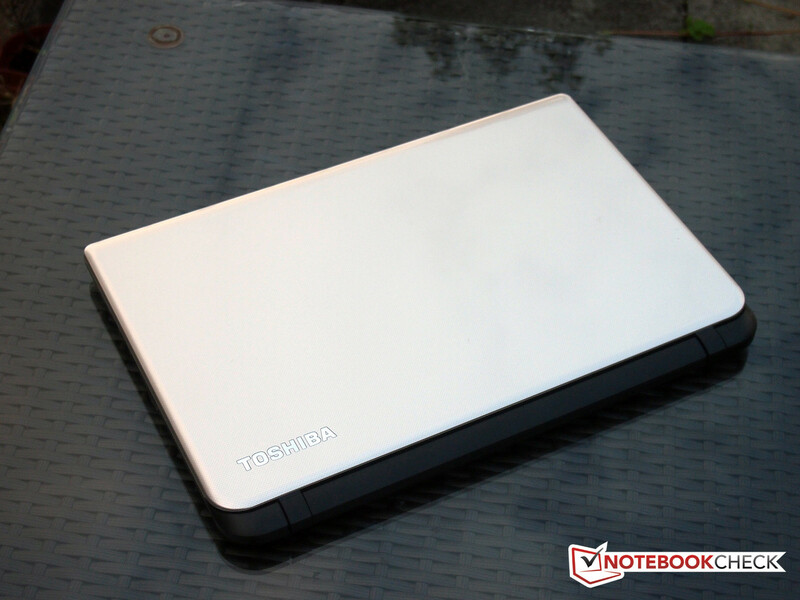 In review: Toshiba Satellite L50-B-182. It features a 15-inch, glare-type screen. The back looks plain and unobtrusive. The manufacturer's logo on the display bezel. The Skullcandy brand stands for good sound. 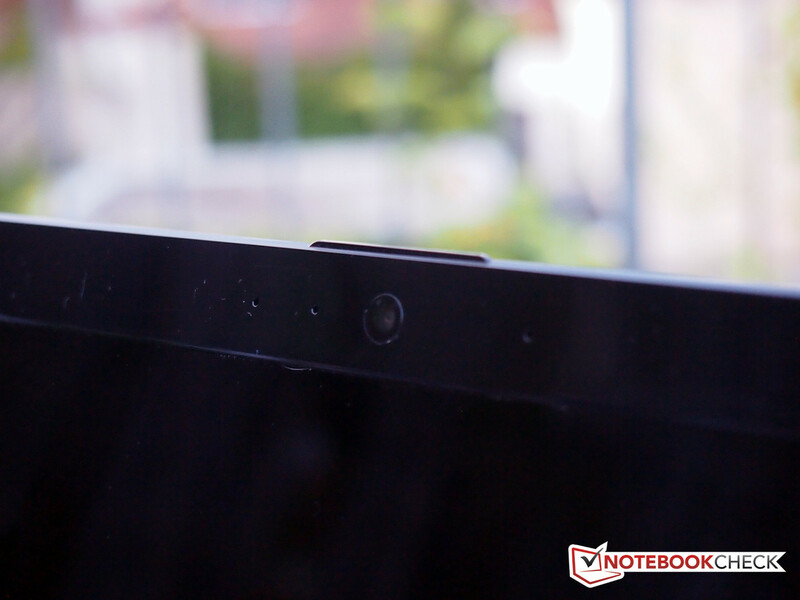 Almost invisible: the webcam above the screen. Stickers on the wrist rest. Solely the SD card reader is on the front. Reversed mapping of the function keys. The keys enable typing quickly. The power button lights up in white when on. 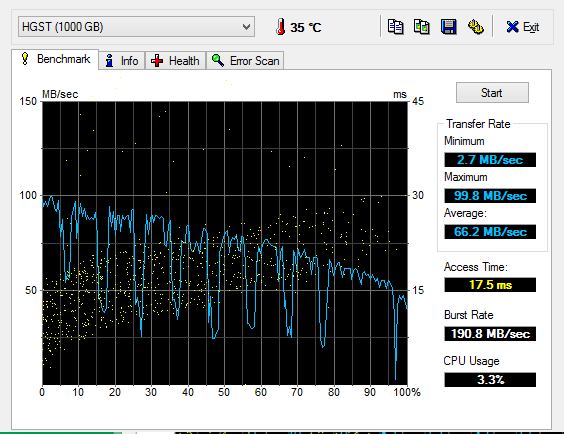 The laptop has Gigabit LAN. The DVD drive is on the left. The fan in the device. 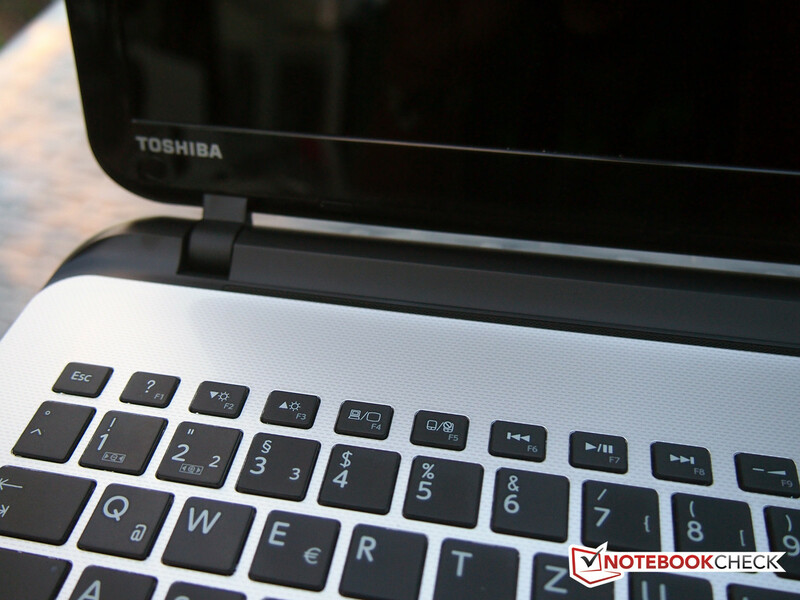 Toshiba's Satellite is an allover solid multimedia laptop without real shortcomings. A higher performance graphics card wouldn't hurt the device. The screen's outstanding brightness and contrast. Asus X750LN, Lenovo IdeaPad Z50, Acer Aspire V7-582PG-74508G52tkk.